He Says “Meow” To His Kitten, But The Response He Gets Back Is Priceless… My Heart Melted, OMG. This man lay his kitten on his lap, which makes the little one very happy. The tiny bengal kitten, only 4 months old here, starts purring and meowing. But oh boy! Just listen to what this tiny kitten has to say! Kitty is so happy and can’t help but start talking to her human. Isn’t this kitten absolutely adorable?—SHARE this cute video with your friends! 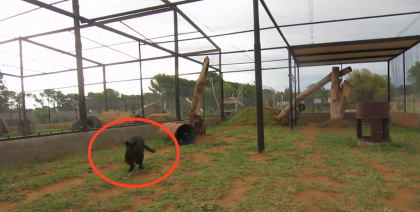 This Black Leopard Sees His Favorite Zookeeper, But Watch What Happens Next… OMG! 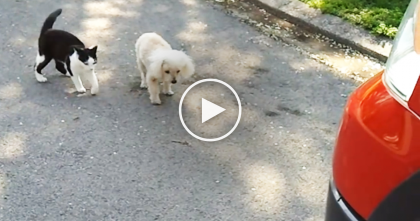 Doggie Is Blind, But Watch And See What THIS Cat Does Next… Amazing!! 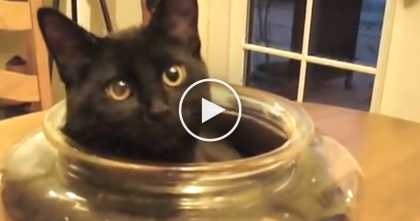 Kitten Discovers A Glass Bowl And Just Can’t Resist The Urge… This Is SOO Funny, He Loves It!! 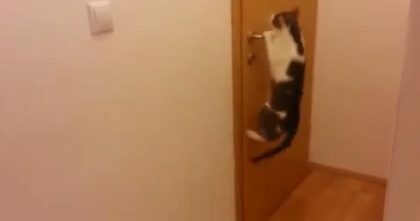 OMG, When This Cat Climbs Up On The Door… Just Watch, Now He Does It Every Day, Hahaha! 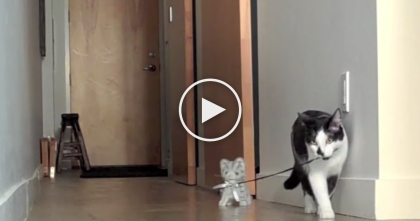 Cat Notices A New Toy, But Just Watch What He Does Next… SOO Cute! !